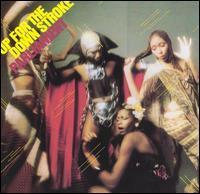 Up for the Down Stroke is a 1974 album by Parliament. It was the band's second album (following 1970's Osmium), and their first to be released on Casablanca Records. The album's title track was Parliament's first chart hit and remains one of the most well-known P-Funk songs. The album also contains a funk reworking of The Parliaments' song "(I Wanna) Testify" under the title "Testify". The original title of the album was "Whatever Makes Baby Feel Good", and the cover of the album featured group leader George Clinton hovering over a woman in distress, sporting a black wig and monster-type gloves. "Up for the Down Stroke" is also notable in that it regenerates George Clinton's professional relationship with bassist Bootsy Collins, who had taken a two year hiatus from the group. Bootsy would play a pivotal role in all of the Parliament albums released through Casablanca Records.